If you are looking for a drink that is definitely not sweet, this is it. It’s warm, perfumy and little smoky while still having bright and bold tones. The charred mango in this cocktail captures a slightly different, more robust sweetness, deepening the flavor profile of the mango and the taste of the sugar- smoky sweet vs just plain sugar sweet. 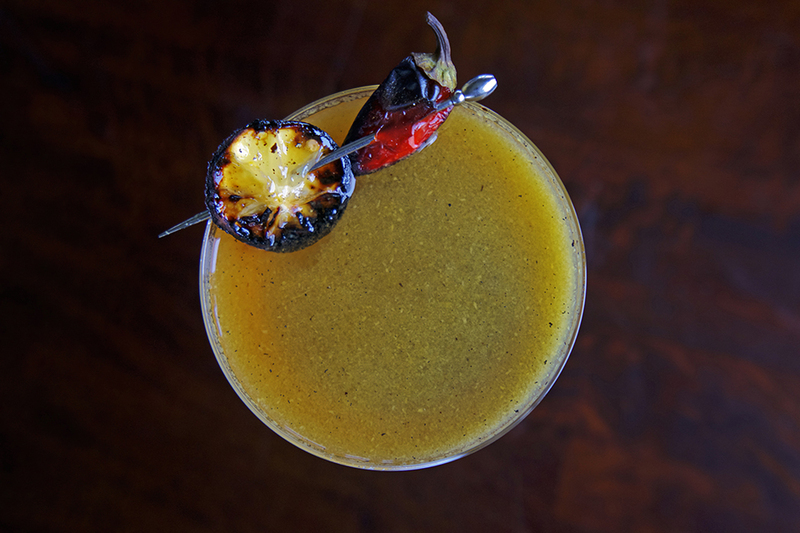 The perfumy essence of mangoes melds well with the vanilla and the powerful smoky mescal is richly warming. This drink is strong but at the same time delicate, which is how we like to describe both a Mexican Mango and Mexico in general! This drink is a celebration of both. We love using Del Maguay Vida Organic Mezcal and Dulce Vida Organic Tequila in this recipe. Combine mescal, tequila, shrub, honey syrup and lime juice in a cocktail shaker. Fill about half way with ice and shake vigorously for about 25 seconds or until the outside of the shaker gets cold and frosty. Strain into a chilled coupe style or low ball glass and garnish with a slice of red chili and a few drops of bitters. Pre heat your oven to broil at about 425°. Brush the sliced mango with honey and sprinkle with salt and place on a baking sheet lined with parchment paper. Bake until charred about 5-8 minutes. In a quart size mason jar combine the charred mango, vanilla bean ( split the bean open and scrape the insides out and add that too), black pepper, cinnamon, sugar, lime juice and zest. Shake vigorously, cover and place in the fridge. Allow to macerate a few days, shaking vigorously a few times a day. Strain the maceration, using a fine-mesh strainer or cheesecloth, making sure to extract all the juice from the charred mango. Discard the solids and the white balsamic vinegar. Chill.